This article is about the political concept. For the 2010 novel, see The Overton Window. For the episode of Billions, see List of Billions episodes § Season 4 (2019). The Overton window is a term for the range of ideas tolerated in public discourse, also known as the window of discourse. The term is named after Joseph P. Overton, who claimed that an idea's political viability depends mainly on whether it falls within this range, rather than on politicians' individual preferences. 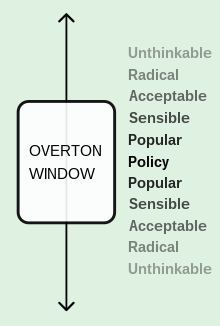 According to Overton, the window contains the range of policies that a politician can recommend without appearing too extreme to gain or keep public office in the current climate of public opinion. The Overton window is an approach to identifying which ideas define the domain of acceptability within a democracy's possible governmental policies. Proponents of policies outside the window seek to convince or persuade the public in order to move and/or expand the window. Proponents of current policies, or similar ones, within the window seek to convince people that policies outside it should be deemed unacceptable. After Overton's death, others have examined the concept of adjusting the window by the deliberate promotion of ideas outside of it, or "outer fringe" ideas, with the intention of making less fringe ideas acceptable by comparison. The "door-in-the-face" technique of persuasion is similar. Noam Chomsky said in 1998: "The smart way to keep people passive and obedient is to strictly limit the spectrum of acceptable opinion, but allow very lively debate within that spectrum - even encourage the more critical and dissident views. That gives people the sense that there's free thinking going on, while all the time the presuppositions of the system are being reinforced by the limits put on the range of the debate." The idea echoes several earlier expressions, the most recent and similarly academic being Hallin's spheres. In his 1986 book The Uncensored War, communication scholar Daniel C. Hallin posits three areas of media coverage into which a topic may fall. The areas are diagrammed as concentric circles called spheres. From innermost to outermost they are the sphere of consensus, the sphere of legitimate controversy, and the sphere of deviance. Proposals and positions can be placed at varying degrees of distance from the metaphorical center, and political actors can fight over and help change these positions. Hallin's theory is developed and applied primarily as a theory that explains varying levels of objectivity in media coverage, but it also accounts for the ongoing contest among media and other political actors about what counts as legitimate disagreement, potentially leading to changes in the boundaries between spheres. As one study that applies Hallin's theory explains, "the borders between the three spheres are dynamic, depending on the political climate and on the editorial line of the various media outlets". In this way, the idea also captures the tug-of-war over the boundaries between normal and deviant political discourse. Many who before regarded legislation on the subject as chimerical, will now fancy that it is only dangerous, or perhaps not more than difficult. And so in time it will come to be looked on as among the things possible, then among the things probable;—and so at last it will be ranged in the list of those few measures which the country requires as being absolutely needed. That is the way in which public opinion is made." "It is no loss of time," said Phineas, "to have taken the first great step in making it." "The first great step was taken long ago," said Mr. Monk,—"taken by men who were looked upon as revolutionary demagogues, almost as traitors, because they took it. But it is a great thing to take any step that leads us onwards. Find out just what any people will quietly submit to and you have found out the exact measure of injustice and wrong which will be imposed upon them, and these will continue till they are resisted with either words or blows, or with both. The limits of tyrants are prescribed by the endurance of those whom they oppress. ^ "Joseph Overton biography and article index". Mackinac Center for Public Policy. Retrieved 2013-08-30. ^ Lehman, Joseph. "A Brief Explanation of the Overton Window". Mackinac Center for Public Policy. Retrieved 7 July 2012. ^ Lehman, Joseph G. (November 23, 2009). "Glenn Beck Highlights Mackinac Center's "Overton Window"". Mackinac Center for Public Policy. Retrieved April 16, 2017. ^ thereisnospoon (May 10, 2006). "Why the Right-Wing Gets It--and Why Dems Don't [UPDATED]". Daily Kos. Retrieved 2018-05-09. ^ NCrissieB (November 5, 2009). "Morning Feature: Crazy Like a Fox?". Daily Kos. Retrieved 2018-05-09. ^ Hallin, Daniel (1986). The Uncensored War: The Media and Vietnam. New York: Oxford University press. pp. 116–118. ISBN 978-0-19-503814-9. ^ Figenschou, Tine Ustad; Beyer, Audun (October 2014). "The Limits of the Debate How the Oslo Terror Shook the Norwegian Immigration Debate". The International Journal of Press/Politics. 19 (4): 435. doi:10.1177/1940161214542954. ^ "(1857) Frederick Douglass, "If There Is No Struggle, There Is No Progress"". The Black Past: Remembered and Reclaimed. Retrieved May 7, 2017. Pilgrim, Mark (23 August 2006). "W3C and the Overton window - includes a clear explanation". Dive into Mark. Archived from the original on 18 July 2011.